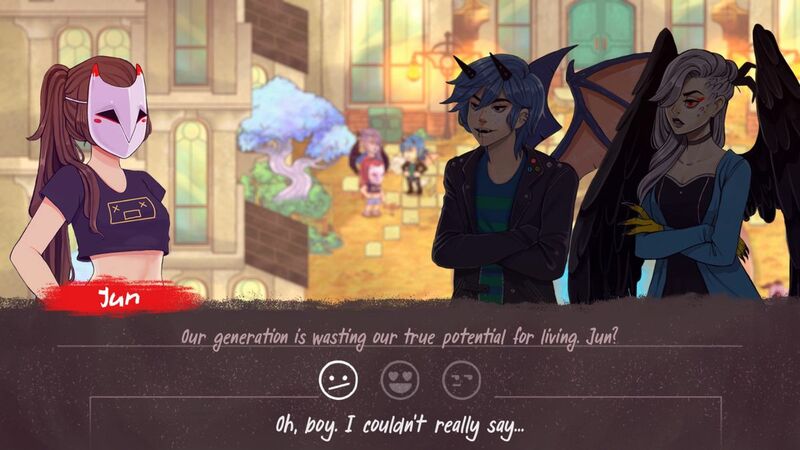 The World Next Door is a great game that I almost wish didn’t meet the short runtime required for this column. It combines elements of action role-playing games with match-3 puzzle gameplay, somewhat reminiscent of the RPG series Puzzle Quest. Its story has hints of Persona and Undertale, hitting on some similar themes of friendship, magic, and monsters. It’s an intriguing mix, but in the four hours or so it can take to finish, it doesn’t feel like you get quite enough time to spend with the characters or the gameplay. You play as Jun, a human high school girl from an alternate-universe version of Earth that is magically linked by portals with another world called Emrys. Emrys is full of magic, and all sorts of humanoid monster-like beings, while Earth is much like our version of it. In the past, when the portals opened it led to fights between the two worlds, but in recent history those tensions have subsided to the point that the portals opening are now celebrations where each world welcomes visitors for the day. At the outset of the game, Jun wins a lottery allowing her to go through a portal and spend the day in Emrys. There she meets up with an internet friend Liza, a demon high school student. Liza takes Jun to meet some of her other friends at a magical shrine where they teach Jun to use magic. But before they’re able to leave, strange magical creatures start attacking the teens, delaying Jun from getting back to the portal before it closes. Battling the strange creatures in these shrines is where the game’s action RPG and puzzle aspects come into play. The shrines look like Zelda dungeons, a sort of top-down view of a grid of tiles. But when you enter an encounter with enemies, you’ll be locked into that space and the tiles then fill with different symbols. Each represents a spell Jun can cast: one lets her shoot a fireball, one electrifies the floor, another heals her. If three or more of the same symbol tiles are touching, Jun can cast the spell associated with them. 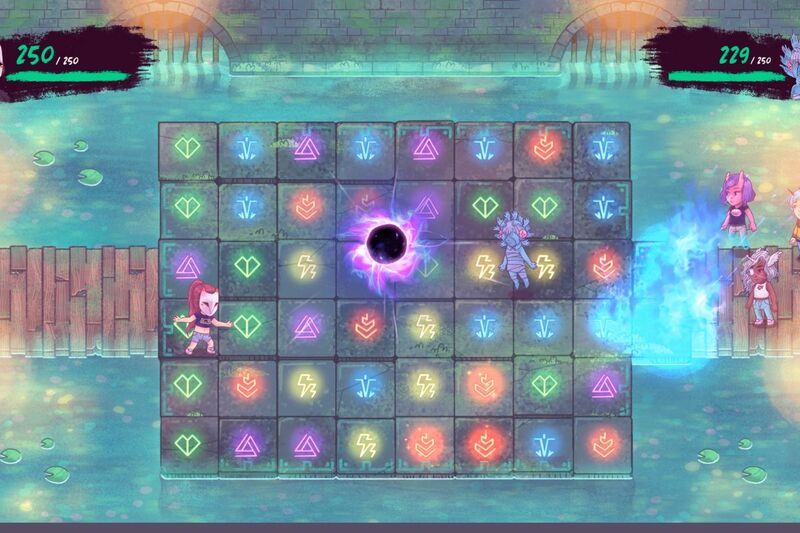 This plays out mostly like a traditional match-3 game; think Candy Crush, but with spell casting. You’re able to swap any symbol in the battle area with any other one in order to create spells, but here Jun acts as your cursor. She has to move to the symbol you want to swap, then to where you want to move it to. Once you have enough of the same symbols touching, she then has to stand on one of the tiles in the matching set to cast the spell. 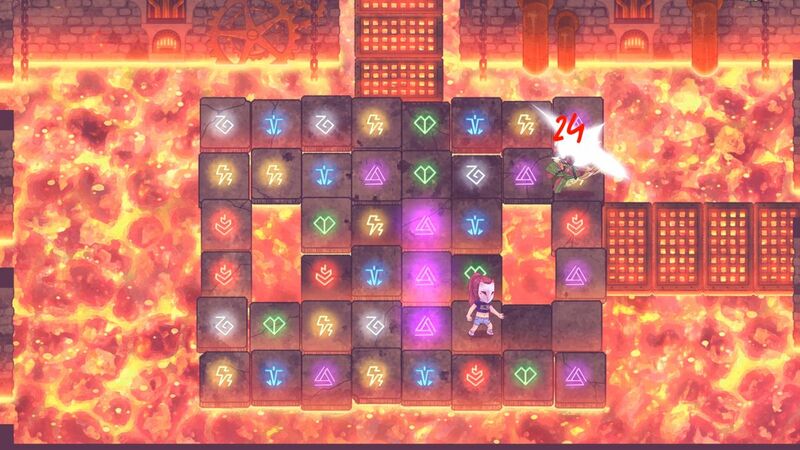 This all happens in real time, so you’ll have to solve puzzles while dodging enemies and their attacks. It can be a bit chaotic, especially as you start to encounter the devious bosses. The reason I wish the game was longer is that I want more of these challenging encounters, the kinds where you spend time becoming familiar with the gameplay systems at a slower pace and with more repetition. I also just want to spend more time with the world and characters. There are some side quests that let you spend additional time with some of the characters, and having more of these would have been nice. Still, even with its short length The World Next Door remains a fun and interesting game. It also helps that the developers seem to be actively taking feedback and are still working to balance the game. (The World Next Door already features an “assist mode” for battles you might find too chaotic or difficult.) After playing through the game, I hope they get the opportunity to do more with it. The World Next Door was created by Rose City Games. You can get it for $14.99 on Nintendo Switch, or Windows and Mac OS (Steam, Itch.io, Humble Store, or GOG). It takes about four hours to finish.